There is no doubt that reading evokes emotion and wakes up the imagination in a way that allows the mind to experience a sensation like nothing else. This is true because there’s nothing like the power of the imagination. Reading, even from the earliest of moments in a child’s life, is the first way we understand the expression of emotion. Newborns are exposed to emotions from the very first sounds we use while reading. The inflections in our voices, the tone and the rhythm of the story expose them to specific feelings and emotions. 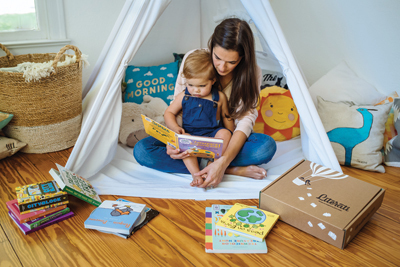 Studies have shown that children who are read to as newborns may have a larger vocabulary, more advanced mathematical skills and may possibly score better on standardized tests. As a mom who loves reading, writing and language in general, I began searching for the best books for my children from the time they were in my belly. With the new wave of online-based retail in almost every sector, going to a bookstore and finding truly special books often wasn’t possible and in many cases disappointing. My mom recently relocated to Florida to retire and discovered a very special company that she learned about through a friend. Literati curates five books each month and sends them to your door. They work with top educators and librarians to curate the best books for newborns through age nine. Once the books arrive, you get to explore them all. You are able to keep what you love and never get stuck with a bad children’s book. There is a prepaid mailer included in your package so that you can easily send back what doesn’t fit your fancy. Literati is more than just books; it’s like a little bit of magic each month. Every box includes original artwork by world-renowned illustrators with themes such as science or art. Every box contains five age-appropriate books, six personalized book stickers, original artwork by a featured illustrator, a handwritten note and additional themed surprises. Last month the theme was friendship, and my boys each got string-knotted friendship bracelets as an added bonus. In addition, with the subscription you receive steep discounts on the books you keep so that your library grows alongside your savings. Books from Literati are discounted 10-30 percent off depending on how many you keep. My trick is to let my boys explore the magic and keep the ones they love, and the others I stash away for birthday gifts for their friends. I always appreciate a beautiful story that can stack neatly on a shelf and fill their brains rather than their baskets of plastic toys! Even in the new age of screens, toys, endless activities and around-the-clock entertainment, it’s still paramount in our home to get lost in the magic of a book. With the help of Literati, I see the change it makes in the language skills of my children; it helps them foster a dynamic approach to the world all the while allowing them to explore the most magical place of all, their imaginations. Select the appropriate age range for your child; there are four clubs spaning newborn through age 9. Five brand-new books arrive to your door every month; explore them for up to seven days. Keep the ones you want, and send back the rest using the enclosed pre-paid mailer for USPS pickup. Take 10% off the purchase of 1, 15% off 2, 20% off 3, 25% off 4 and 30% off all 5 books. This service is $9.95 a month and you can cancel anytime.